Please follow these instructions in order to use my battery analysis script. Charge your phone to 100%. While still charging, complete the following steps. Download Current Widget by RmDroider from the Google Play Store. Please read the description for Current Widget. As RmDroider says in the description, Current Widget will not work for certain phones (mainly Samsung) because the hardware or drivers for current widget to measure current are not included in the phone. There is no fix for this. Under the General heading, set your update interval. Faster interval equates to more accuracy and also drains battery a bit faster. If you just want to do your test, make this 1 second. Under Log Options (which is under the Log heading) , make sure that Log Applications is not checked. If you want to check Force Log In Sleep Mode you may. In theory more data points leads to more accuracy, but I have not done the tests to see if the resulting change in output is appreciable or not. If you want to make two runs and compare the output (obviously this is not a scientific/statistically significant comparison), please be my guest. Post your results below if you wish. You should be set to go as far as setting the widget up. For current widget to log the appropriate values, you need to have it log a full charge/discharge cycle. If you do not log a full cycle, i.e. you submit your log without having fully discharged your phone, then the reading will not be accurate. 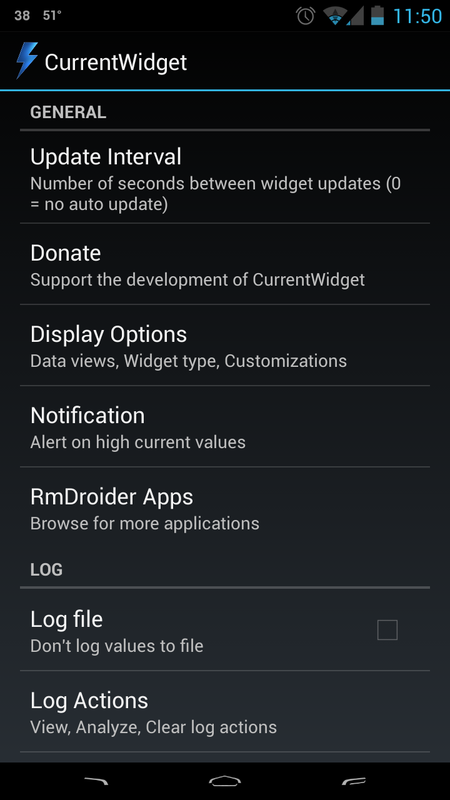 Once current widget is installed, configured, and logging values you may unplug your phone. Use your phone until it is down to a low percent (the lower the better–I would do around 2 or 3. Battery Indicator by Darshan Computing, LLC is great for this). At this point, email your log to yourself or upload it to Dropbox or do whatever you can to get it off of your phone. Not doing a full discharge does cause some small errors; I am trying to code a workaround that allows you to upload something like a full discharge and then charge and then the script sorts out everything but the full discharge. Make sure the script is of the format Date Time, current, battery percent. Your CurrentWidget output log should look something like this. Upload your output to the script to be analyzed. Comment on this post with your phone model and battery capacity (and battery if you are not using the stock battery). That way people can compare their phone against yours and others. Also, if you do not mind, put your country. I am interested in who is actually using my script (Google Analytics only tells me who hits the page, not who cares enough to go through the test and read the results). If you are interested, the code is open source and can be found at https://github.com/nkhosla/battery_capacity. Please understand that my script is not completely accurate. There are inherent errors with trying to measure battery capacity like this, and although I am working toward minimizing them they do exist. Additionally, I am not responsible for anything that happens to your phone as a result of installing the apps recommended above. All recommendations are done so because I think the app mentioned does its job well, and for no other reason. By clicking the link below, you agree that I am not responsible for your actions and that you understand this analysis is not exact. We are a mobile marketing company that has been working for leading advertisers such as LG, SK, Nexon and Konami since 2011. We would like to ask you if you want to monetize your traffic by our top leading offers. The widget is not indicating ‘mA’. I’m using Samsung A7. I do not make the android app, so I cannot help support it. It could be that your phone doesn’t have the drivers for the app to use to read mA out of the battery. Some phones do not support this feature. tried to upload and here’s the result..
And also I see that the gitbhub code has disappeared, so haven’t been able to try running this locally. Hi. I have MI 3 and Redmi 1S phones. Current Widget works fine with MI3 but not with Redmi 1S. Can you help me? I wish I could, but I have no role in the development of Current Widget. My best guess would just be that the Redmi 1S does not have the necessary battery drivers in the kernel or possibly even in hardware support. Sorry! So I have taken quite some time to reply, but if you do ever get this (if you put your email in on the comment field you should get an update), I would love to debug some. Just reply here. Thanks. I installed the app on a droid razr m and nothing happens ie I don’t get any information. does this mean the app is not compatible with my phone? In spite of that, your Current Widget doesn’t display anything on screen. Just the widget “Lightning” icon and in the notification bar I can read “no data – no data – no data”. Where do I find the logfile? Why do you need to see it? Did you get an error? The script is very simple, so I have not added any type of diagnostics or anything. There is no logging. There is even no error catching. Probably a poor decision on my part, but whatever. Maybe I will eventually update the script to at least catch the error and notify the user. If you want to post a screenshot of the error I can probably help. Hi! I don’t actually need to see it. I just want to email it to myself as you wrote so I can upload it here. I think something is wrong. If I go to settings, log, log actions and view log I get the message “log file not found” Under log options log filename and log applications are grey. Ah. OK. I see what the problem is. Ignore my previous post. I thought you meant an error log of the analysis script. I actually have nothing to do with the development of CurrentWidget. If you want to email the dev, you should use his email (it is listed in the Google play store somewhere on the CurrentWidget page). I can, however, help you with your problem. I played a lot with CurrentWidget in order to see what options I had for the analysis, so I know my way around it. Just to confirm, if you add the widget to your home screen you see nonzero values for current, right? If so, your problem might be that logging might not be enabled. If you look at my first picture, you see at the bottom of the screenshot there is a checkbox for ‘Log file’? You have to check that. Without it, CurrentWidget will not log anything. Sorry about that. My directions were unclear (I reread and nowhere do I say that that checkbox needs to be checked). Hi. Thanks for your answer. I saw “log file” in the settings but it said “don’t log values to file” so I thought that if I checked it, it would do like that. Now I see it changed to “log values to file” when I checked it 🙂 Hmm, it still does not work, but it is probably because I have a Samsung Galaxy Note. I also have a Nexus 10 I will try it on. Hi,how can i execute the script? Well, there are two ways. The first way is as I intended, which is following the above instructions and uploading the output of CurrentWidget. At that point, my server runs the script and spits out a number for you. The second way is to download the source from GitHub, modify it to work on a computer as a not-server script (currently it is made to accept a file from an HTML form and then return the analysis as HTML). This also includes installing things like numpy, which is less than a good experience. If you know what you are doing and want to play around, this is a good way to do it. If you need any help doing the first method, just reply and I am happy to help. Thanks for your great Tool, Nathan! HD2, same ROM, official extended battery, got it from someone else recently, probably heavily used and that white dot is pink/purple/red, so it was wet at some point in the past, approx. 2063mAh (should be 2300mAh). Oh, I’m from Poland by the way if it really matters. Thanks. Google Analytics tells me people are hitting this page, and my script has been run a good number of times, so at least there is that. The comments were more to satiate my own curiosity. Your two comments make me curious about what is an expected degradation in battery capacity. Hmm…I have some time set aside next week to update the script, and my only goal was to make it filter out a discharge cycle from a log containing multiple charges and discharges (so that this ridiculous email to yourself at 1% battery can be avoided). Perhaps I will investigate if there are any models for what battery degradation should look like vs number of cycles (given otherwise ideal-ish circumstances, of course) that I can incorporate. Sort of like a guess at how many full charge equivalent cycles your battery has undergone. Going to try it tomorrow..
HD2, stock battery (1200mAh), approx. 2.5 years old, ROM is Xylo’s PAC from 13 Nov 2012, capacity now ~975mAh.